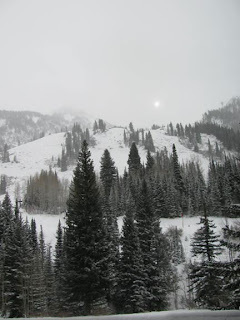 Mike and I went Snowbird UT early in December. He was there for a conference; I was there to play! I hiked around the gorgeous resort area taking pictures. Later, I relaxed on a spa-like reclining chair, sketching the trees. 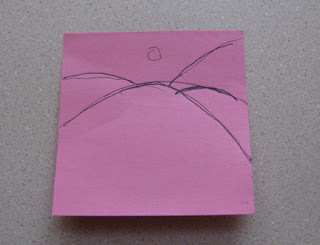 My sketching is marginal at best, but I was pleased with some of the abstractions I came up with. I knew that my next project was going to be a quilt that used those trees, but Christmas was fast approaching, and it was going to have to wait. When we returned home, my plans changed somewhat. I was looking at some shibori fabrics, and noticed that some of the patterns reminded me of the landscape that I'd just left. Originally I had planned to do a small quilt that featured one tree, or even just a part of the tree. But after spending some more time looking at my pictures, I decided that a cluster was going to be the thing instead, and shibori fabric would be the background. But first I had to figure out how to make it! 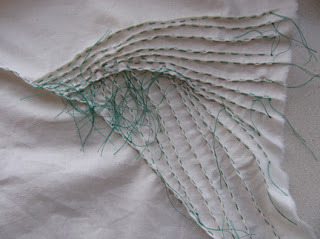 There are many different stitches used in creating shibori fabrics, and I am far from an expert in any of them. I chose to use the ori-nui resist pattern. 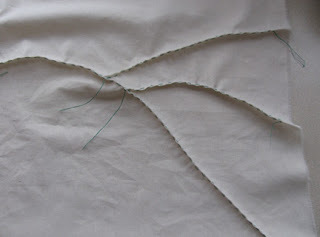 To do this, you make a small fold along the design lines, and place a running stitch just below the crease in the fold. 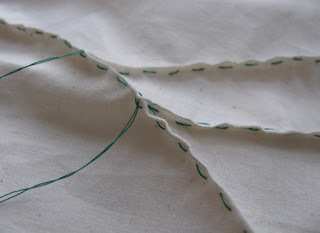 When all the lines are stitched, the threads are pulled tight and the fabric is dyed. 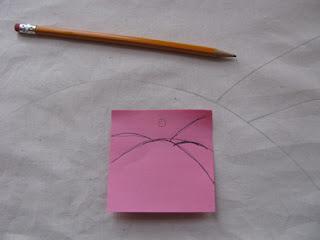 My first step was to roughly sketch the landscape pattern that I wanted, and to sketch it onto my unbleached muslin fabric. 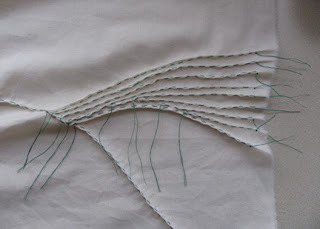 I then spent the rest of the day stitching my lines! Wow, I can hardly wait to see more! That is so neat, Cyndi- I look forward to seeing how it progresses! 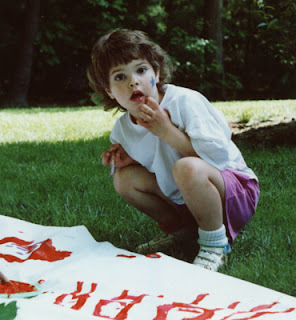 Wherever did you learn about shibori and ori-nui?! Fascinating. You are an absolute font of information, Cyndi. This quilt will be beautiful I'm sure. I can't wait to see how you do the dye resist. I had never heard of this before, interesting. I like how it includes stitching. Wow - Looks like lots of fun even if it is a lot of work. I can't wait to see what it looks like when you are finished! Thanks for the close ups and explanations. 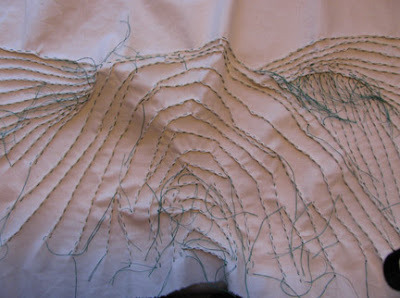 Do you know thats the first time I have understood what was going on with the stitching.